– attend an animal fighting venture; whoever violates shall be fined, imprisoned for not more than 1 year, or both, for each violation. Legalize Liberty! Legalize Cockfighting! Legalize Cockfighting Family Values! Formerly the “Federal Agriculture Reform and Risk Management Act of 2013”, is a bill that would authorize nutrition and agriculture programs in the United States for the years of 2014-2018. The bill authorizes $956 billion in spending over the next ten years. The bill passed in the United States House of Representatives on January 29, 2014 during the 113th United States Congress. The bill is considered two years late, since farm bills. Eventually, on October 12, 2013, the House agreed to a conference on the bill and conferees were chosen: Southerland, Fudge, Camp, Sam Johnson of Texas, Levin, Royce, Marino, Engel, Lucas, King of Iowa, Neugebauer, Rogers of Alabama, Conaway, Thompson of Pennsylvania, Austin Scott of Georgia, Crawford, Roby, Noem, Denham, Rodney Davis of Illinois, Peterson, McIntyre, Costa, Walz, Schrader, McGovern, DelBene, Negrete McLeod, and Vela. On January 27, 2014, the Conference Committee report was released. On January 29, 2014, the House voted 251-166 to pass the bill. In the House, a majority of Republicans voted in favor of the bill (163-62) and the Democrats split almost evenly (89-103). The Senate then voted 68–32 on February 4, 2014, to approve the full five-year farm bill, sending it to President Barack Obama to be signed into law. SEC. 12308. AMENDMENTS TO ANIMAL WELFARE ACT. (D) in subsection (n), by striking ‘‘; and’’ at the end and inserting a period. (2) LICENSING.—Section 3 of the Animal Welfare Act (7 U.S.C. 2133) is amended by striking ‘‘: Provided, however, That any retail pet store’’ and all that follows through ‘‘under this Act.’’ and inserting the following ‘‘: Provided, however, That a dealer or exhibitor shall not be required to obtain a license as a dealer or exhibitor under this Act if the size of the business is determined by the Secretary to be de minimis.’’. ‘‘(B) knowingly cause an individual who has not attained the age of 16 to attend an animal fighting venture.’’. ‘‘(b) ATTENDING AN ANIMAL FIGHTING VENTURE.—Whoever violates subsection (a)(2)(A) of section 26 of the Animal Welfare Act (7 U.S.C. 2156) shall be fined under this title, imprisoned for not more than 1 year, or both, for each violation. ‘‘(c) CAUSING AN INDIVIDUAL WHO HAS NOT ATTAINED THE AGE OF 16 TO ATTEND AN ANIMAL FIGHTING VENTURE.—Whoever violates subsection (a)(2)(B) of section 26 (7 U.S.C. 2156) of the Animal Welfare Act shall be fined under this title, imprisoned for not more than 3 years, or both, for each violation.’’. Guam – Senator Rory Respicio is concerned about a provision in the farm bill passed by the U.S. Senate today. He’s written to Congresswoman Madeleine Bordallo for clarity on whether the measure would prohibit cockfighting in Guam. The farm bill reportedly includes a provision that would make it a federal crime to attend or bring a child under the age of 16 to an animal fighting event including cockfighting. The farm bill also includes a provision which cuts food stamp funding by around $8 billion over ten years. The measure heads to the president for his review. Washington (CNN) — It may be the most overlooked mega-bill of the past 12 months. The nearly $1 trillion farm bill received final approval on Tuesday from the Senate, which sent the compromise already passed by the House to President Barack Obama to be signed into law. While it’s called the farm bill, in truth, it’s more of a food bill. It sets five years of eating and farming policy in the United States, including what we grow, what you know about your dinner and how much government spends in the process. It cuts the food stamp program and increases spending on farmers markets. Whatever you think of Congress, this is a bill that deserves some attention. 1. You will know a lot more about your meat: How much do you know about the chicken breast you just bought? Or that ribeye? This farm bill marks a major decision in the fierce fight over product labeling, by backing a new requirement that pork, chicken or beef sold in the United States must include details on where the animal was born, slaughtered and processed. Take a look at a package of meat in the store tonight and you’ll see it. That information has been on labels since the fall. But Canadian and Mexican meat producers have fought the new U.S. labeling rule in world courts and furiously tried to have it reversed by the farm bill. In the final days of negotiations, lawmakers decided to keep the meat labeling rule. So if your meat is from the U.S. or if it was ever handled in Mexico, Canada or Australia, you’ll know. 2. Farmers will see less risk; federal government takes on more: The bill dramatically changes 82 years of agricultural subsidies, ending guaranteed payments that farmers receive regardless of their harvest quality or crop prices. But, because those “direct payments” have been in place for generations, many farm values became based on the expectation of government dollars. Ending them could have wide-ranging effects. To try and mitigate the hit, the farm bill beefs up a different kind of subsidy — a subsidy for crop insurance. This is complex, but in short, the government will make crop insurance cheaper and it will pay out some benefits at lower levels than previously. That will make farming less risky for some. But it transfers that risk to the federal government, which could be even more on tap if crop prices plummet or if a disaster hits. Good for farmers, risky for the deficit. 3. Lawmakers aren’t disclosing something: Just like any farmer, members of Congress who own farmland can receive the crop insurance subsidies we talked about above. This can significantly cut premiums and save a bundle of money. The Republican House initially thought it was a good idea to know who in Congress would benefit from those subsidies and the original version of the bill included a requirement that lawmakers disclose if they or anyone in their immediate family receive the government help. But the Senate did not include the provision and in the end the House and Senate agreed to drop it. Lawmakers could have opted for a higher standard of transparency either for themselves or for everyone receiving these subsidies, but instead the public will have no way of discovering where this money flows. 4. We have land problems: The race to scoop up recent farming profits, especially in corn, has led to increased plowing of virgin lands in the United States. At the same time, rural areas face more soil erosion and other issues from land that has been worked for generations. The farm bill does something new on both issues. 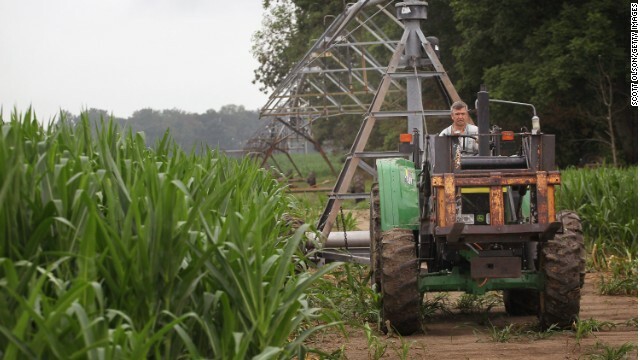 It forces farmers who want subsidies to follow a series of conservation practices. And it aims to protect more prairie land by cutting subsidies in half for people who farm on some virgin sod. Environmentalists have applauded the provisions, but aren’t doing back flips. They note that the bill cuts direct spending on government conservation programs overall. 5. What goes in your body — corn and sushi: The farm bill decides which crops the U.S. government wants to encourage or protect. It gives incentives to grow more of them. The most subsidized crops in this (and in most farm bills of the past) are the so-called “row crops,” things like wheat, soy, and the king of American agriculture, corn. These subsidies are one reason corn will remain one of the country’s most reliable sources of food, from cattle feed to soda sweetener. The green and yellow vegetable will be a major part of your life for the foreseeable future. At the same time, this bill adds a few new winners to the list of subsidized row crops, among them sushi rice. If sushi rice prices fall too low, the government will now make up the difference. The possible result of that? More farmers will consider planting the crop. And there will likely be more American sushi rice to go around. WASHINGTON—The Senate approved a five-year agreement on farm policy Tuesday, ending a nearly three-year slog in Congress. The overhaul of agriculture policy and food-stamp funding had been weighed down by both partisan and regional disputes. The U.S. Senate approved a five-year agreement on farm policy, ending a nearly three-year slog in Congress to overhaul agriculture policy and food-stamp funding. Jerry Seib reports on the News Hub. Photo: AP. In a 68-32 vote, the Senate passed the first comprehensive farm package since 2008. It passed with the support of 46 members of the Democratic caucus and 22 Republicans. Nine Democrats and 23 Republicans voted against it. The House passed the bipartisan deal last week, and President Barack Obama is expected to sign the bill into law soon. The farm package ends the direct payments system rooted in the 1996 law, under which the federal government has been doling out roughly $5 billion in annual payouts to farmers, regardless of crop prices or farm incomes. Instead, lawmakers bolstered crop insurance offerings, a move designed to force farmers to put more “skin in the game” with their crops, though the federal government subsidizes the insurance premiums. “With crop insurance, farmers don’t get a check—they get a bill,” said Senate Agriculture Committee Chairman Debbie Stabenow (D., Mich.), the first woman to helm passage of a farm bill. The farm bill sets in motion policies expected to cost $956 billion over 10 years, less than it would have cost if the 2008 law was extended. Nutritional assistance accounts for $756 billion of the bill’s cost. The legislation is expected to reduce the federal budget deficit by $16.6 billion over a decade, according to the nonpartisan Congressional Budget Office. Critics of the bill have argued the legislation could end up being more expensive than expected, since the new support programs are more sensitive to weather and market conditions than the fixed sum meted out under direct payments. Some conservative lawmakers balked at both the government support offered to farmers and the bill’s cuts to food-stamp funding, which were more modest than some Republicans wanted. Sen. Mike Lee (R., Utah) called the bill a “Beltway marriage of convenience between welfare and corporate welfare” on the Senate floor. The GOP-controlled House had previously passed legislation cutting nearly $40 billion over 10 years from nutrition programs. The final bill cuts around $8 billion from food-stamp funding largely by increasing the level of federal heating assistance required to trigger higher benefits among some recipients. Under the bill, a household would have to receive at least $20 in annual payments through a federal energy assistance program to qualify for a utility allowance, which, when deducted from a household’s income, can result in a larger food-stamp benefit. Some states currently give food-stamp recipients a nominal “heat and eat” payment of $1 or another token sum to help households leverage larger food-stamp benefits. Stalks of soft red winter wheat are seen on a farm in Dixon, Illinois, July 16, 2013. (Reuters) – The U.S. Senate gave final congressional approval on Tuesday to a nearly $1 trillion farm bill that trims food stamps for the poor, expands federal crop insurance and ends direct payments to farmers, and sent it to President Barack Obama for his expected signature. The Senate voted 68-32 to pass the sweeping bill, which is more than a year overdue after congressional negotiations bogged down on a host of issues, including the size of cuts to the food stamp program. Last week the House of Representatives passed the legislation by a wide margin. The White House has said Obama would sign the bill. The Congressional Budget Office says the $956 billion legislation will save $16.6 billion over 10 years compared to current funding. Using a different scoring, congressional leaders put the savings at $23 billion. About $8 billion in savings over 10 years comes from cuts to the Supplemental Nutrition Assistance Program, commonly known as food stamps, which accounts for nearly 80 percent of the bill’s spending. The program provides funds to about 47 million low-income people to buy food. The food stamp cut was well below the $40 billion reduction advocated by the Republican-led House, but still double the amount originally supported by the Democratic-run Senate. A farmer verifies his planter is dropping corn seeds at the appropriate depth outside of Henry, Illinois. The Senate passed and sent President Barack Obama a measure that sets U.S. agricultural policy for five years, ending the toughest legislative battle on renewal of the farm bill in almost two decades with cuts to crop subsidies and food stamps. The Democratic-led Senate voted 68-32 today for the bill, joining the Republican-controlled House that cleared the legislation last week. The measure, which Obama said he will sign, ends a $5 billion annual crop-subsidy program and relies on insurance as the main form of farm aid. The plan calls for spending $956.4 billion over 10 years — $16.6 billion less than current levels, according to the Congressional Budget Office. Passage reflects the clout of rural and urban allies who kept farm subsidies and nutrition programs together over Republican objections. It is the third significant, bipartisan bill adopted by the current Congress, which passed a budget in December and cleared a $1.1 trillion spending bill last month. The legislation took a tortured path through Congress, as House Republicans delayed or rejected passing measures the Senate had twice endorsed. Some lawmakers sought to use the legislation governing U.S. Department of Agriculture programs to curb spending and end subsidy programs. Obama endorsed the bill in a statement, and said it improved farm and nutrition policy through compromise. The bill ended up cutting food-stamp spending by $8.6 billion over 10 years, though additions to other programs bring nutrition-aid cuts down to $8 billion. That is one-fifth of the $40 billion in cuts sought by House Republicans. The reduction would equal about 1 percent of the program’s record $79.6 billion in spending for the budget year that ended Sept. 30. Opponents criticized the bill’s cost and lack of transparency, saying the plan hurts the poor while wasting spending on wealthy farmers. Negotiators left out a House measure to require members of Congress and the president’s cabinet to report what they receive in crop insurance aid. Also omitted was a Senate-backed provision to limit premium subsidies for the wealthiest farmers. “The only policy that gets bipartisan traction in Congress is Washington’s desire to hand out taxpayer money like it’s candy,” said Senator John McCain, an Arizona Republican who voted against the bill. Groups representing meatpackers such as Tyson Foods Inc. (TSN) failed to persuade legislators to roll back U.S. labeling standards to disclose the country of origin for cattle. Those rules have been challenged at the World Trade Organization. The legislation subsidizes crop-insurance provided by companies such as Ace Ltd. (ACE) and funds purchases at Kroger Co. (KR) and other grocers with food stamps, its biggest cost. Total savings from the bill will be $23 billion over 10 years, higher than the budget-office estimate, after automatic cuts in all federal spending tied to an earlier budget deal are included, according to agriculture committee staff. The bill ends the possibility, for at least five years, of U.S. farm policies reverting to a 1949 law that would potentially double milk prices. Final passage ends the agriculture community’s toughest legislative fight in almost two decades. At least 350 companies and organizations, including Monsanto Co. (MON), PepsiCo Inc. (PEP)and Dean Foods Co. (DF), registered as lobbyists in 2013 to work on the Senate bill, spending $150 million, according to the Center for Responsive Politics. Only bills on the federal budget, immigration and defense generated more lobbying interest, according to the center, a Washington-based research group that tracks campaign donations. The bill is H.R. 2642. A combine drives past the piles of straw that is left over from the harvesting of soft red winter wheat on a farm in Dixon, Illinois, July 16, 2013. (Reuters) – A U.S. farm bill was passed by the U.S. Senate on Tuesday and sent to President Barack Obama for his expected signature. The legislation, which was approved by the House of Representatives last week, will cost an estimated $956 billion over 10 years, a savings of about $16.6 billion compared with current funding, according to the Congressional Budget Office. The following are some provisions of the wide-ranging legislation, which comprises everything from food stamps and farm subsidies to meat labeling and crop insurance here . Funding for the Supplemental Nutrition Assistance Program, commonly known as food stamps, was cut by about $900 million a year, or roughly 1 percent. SNAP and other nutrition programs account for more than three-quarters of the farm bill’s spending – some $756 billion over a decade. Liberal lawmakers argued against the reduction at a time of relatively high unemployment. Conservatives said the cuts did not go far enough in a program whose spending has more than doubled since 2008. The savings are expected to come from reducing benefits to people who are also enrolled in a federal heating assistance program. An estimated 850,000 households in 16 states and District of Columbia will lose about $90 a month in SNAP benefits. The legislation ends a nearly two-decade-old program of direct payments to farmers, which cost about $5 billion a year and went to farmers and landowners no matter how much money they made or even whether they actually farmed their land. At a time of rising farm income, the plan had become politically untenable. With the end of direct payments, lawmakers have instead expanded and revised crop insurance programs, and the expansion could put the government on the hook for bigger payouts in times of poor harvests. This provision, which has been around since the 2002 farm bill, requires meat sold in the United States to be labeled as to where animals are born, grown and processed. It remained in the 2014 bill despite heavy lobbying from the meat industry, which said it was a bookkeeping nightmare for meatpackers. Mexico and Canada, two of the largest exporters of beef to the United States, have challenged COOL at the World Trade Organization. U.S. ranchers and consumer groups largely support COOL, arguing that consumers deserve to know where their meat comes from. There was a battle between Democratic Representative Collin Peterson of Minnesota, backed by dairy farmers, and Republican House Speaker John Boehner over Peterson’s proposal to couple a new margin insurance program with a system to cut milk production if prices fell below a certain level. Boehner, who had the support of cheesemakers and food processors who want lower milk prices, said he would not allow a vote in the House if it included Peterson’s supply management plan. The final bill excluded supply management but made changes to the insurance plan, and Peterson said he could live with the compromise. This amendment, intended to block a California law requiring that all eggs sold in the state come from chickens kept in nonconfining cages, was included in the House-passed bill but was dropped from the final legislation. Critics said the provision, pushed by Republican Representative Steve King of Iowa, could have invalidated hundreds of state laws on animal protection and food safety. King, supported by egg growers in Iowa and other states, said the California law violated the interstate commerce clause of the U.S. Constitution. Rural counties in the West breathed a sigh of relief after the farm bill included a payment in lieu of taxes program (PILT), which pays local governments for the tax revenue they cannot collect on federal lands. The $400 million-a-year program was a late addition to the farm bill after it was not included in the January budget deal. A bipartisan group of 16 senators had urged that PILT be included in the farm legislation. With marijuana laws loosening, supporters of industrial hemp saw an opening and pushed through a provision that allows colleges and state agencies to grow and conduct research on the crop in the nine states where it is legal. Kentucky is among them and Mitch McConnell, the top Republican in the Senate, was a big backer of the provision. Industrial hemp, which can be used to make clothing, food, building materials and a number of other products, has low levels of the chemical that gets people high. Growing or using it is illegal under federal law. A provision removes subsidies for fuel pumps in rural areas that blend gasoline with higher concentrations of biofuels, like corn-based ethanol. Ending the subsidies was a blow to the Obama administration, which in 2010 set a goal of helping gas station owners install blender pumps over the next five years to promote consumption of higher-ethanol gasoline. Fiscal conservatives are particularly incensed by a provision in the bill that imposes a 15-cent fee on every fresh-cut Christmas tree sold in the United States, with the money being used to promote demand for trees. Critics call it a tax and say it will be passed on to consumers in the form of higher prices. Christmas tree growers say the fee, which is expected to raise about $2 million a year, is similar to other commodity “check off” programs, like the successful “Got Milk?” campaign, which use funding to promote an industry. Next Post Who is Americans Watching Washington? A lobbyist behind AGDN?